You can always find the latest version of this map, and a list of all related articles, on our Which Countries Recognize Taiwan? page. Click to enlarge. By Evan Centanni, modified from public domain blank world map. This past May, disputed Taiwan lost its official endorsements from both the Dominican Republic in the Caribbean, and Burkina Faso in West Africa. The two countries have cut ties with Taiwan in favor of setting up official relations with Mainland China, endorsing the Mainland's claim that Taiwan is part of China. The islands of Taiwan operate like an independent country today, but are governed under the constitution of the "Republic of China" (ROC), the government that ruled Mainland China before the country's communist revolution (the administration that now rules the Mainland is called the People's Republic of China, or PRC). Since 1991, Taiwan's government has sought recognition separate from Mainland China in the UN, without challenging the PRC's right to the Mainland. But because the Mainland government insists Taiwan can't be separate, it cuts ties with any countries that set up relations with Taiwan, even if they want to stay friends with China too. The Dominican Republic announced it was cutting ties with Taiwan on May 1, 2018, saying the reason was "history and socioeconomic reality". This reality allegedly includes the equivalent of $3.1 billion US dollars in investments and loans from China, though the Dominican government only mentioned future tourism opportunities as an example. Burkina Faso followed on May 24, even though it had just co-sponsored Taiwan's bid to become an observer at World Health Organization (WHO) meetings. The Burkinabe government also cited "socio-economic challenges" and the "evolution of the world" as the reasons for its switch. Learn More: What Exactly is Taiwan, and Do Countries Really "Recognize" It? Today, only 18 countries in the world (about 9%) still have formal diplomatic relations with the Taiwan-based "Republic of China" government - the closest equivalent to officially "recognizing" Taiwan as a country. Before the Dominican Republic and Burkina Faso cut ties in May, the last two countries to drop Taiwan in favor of the PRC were Panama in June 2017 and São Tomé and Príncipe in December 2016. Only one country, the Gambia, abandoned Taiwan between 2008 and 2016, during a "diplomatic truce" initiated by Taiwan's most Mainland-friendly president (even then, the PRC waited until Taiwan elected a more independence-leaning president before restoring its own relations with the Gambia). Taiwan's last remaining "diplomatic ally" in Africa is tiny Eswatini (Swaziland), whose king recently promised not to follow Burkina Faso in switching to the PRC. Supporters of a separate Taiwan worry their next loss might be the Holy See, government of the Catholic Church's independent Vatican City in Rome. The Vatican has recently been working to patch up its bad relationship with the Mainland Chinese government. Learn More: What's the difference between Vatican City and the Holy See? 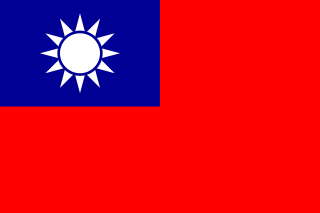 Graphic of the Republic of China (Taiwan) flag is in the public domain (source).